Alliance Genetics is expanding its Ontario purebred nucleus herd with a new partner. Mike and Amy Cronin of Cronin Family Farms are joining Alliance Genetics Canada (AGC) with a new 1,500-sow barn in Norfolk County that will serve as a purebred genetic nucleus for Vista Villa Genetics, a partner in AGC. The Cronins join existing AGC nucleus and multiplier herds Vista Villa Genetics, Bodmin Genetics, BMR Genetics and Clarion Swine in Ontario, and Sandridge Genetics in Alberta. Vista Villa suffered a barn fire followed by a Porcine Reproductive and Respiratory Syndrome (PRRS) outbreak in the past year, which the Cronins too had a barn fire on their Norfolk County farm site. It was these tragedies that ultimately brought the families together under the AGC umbrella. The Cronins farm 6,500 sows with operations in Ontario, Iowa and Missouri. Amy Cronin, who runs the business with husband Mike, is a past-chair of Ontario Pork and chair of Swine Health of Ontario. The new barn is state-of-the-art, incorporating learnings around group sow housing and niche market production from the Cronins’ other facilities and underlining their commitment to top-level biosecurity and animal and worker wellbeing. The new building features electronic sow feeders, stalls that lift as a unit when sows stand up, a loading chute with regulated air to keep air from coming into the barn, a double-layered entry system to ensure no outside boots or clothing make it into the barn, in-floor heating, and an Airworks heat exchange ventilation system that provides a consistent supply of clean, fresh air in the barn. The Cronins have been married and farming together for 23 years, starting with 600 sows farrow to wean in 1998. 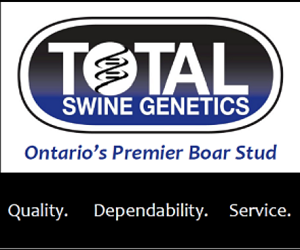 AGC is a family-owned swine genetics company that was formed when some of Ontario’s most long-established, independent swine breeding families joined forces to compete against larger multinational businesses. The company supplies more than a quarter of Ontario’s commercial hog market with genetics, and its purebred nucleus is the largest in Canada.